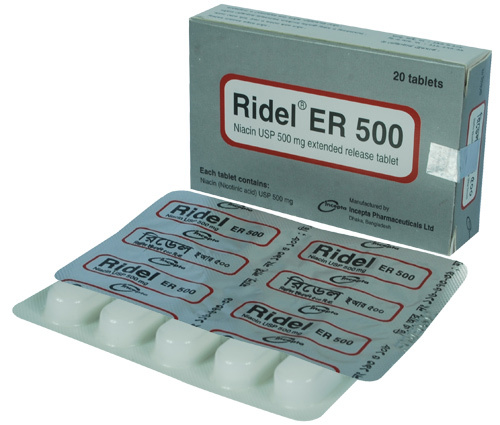 Ridel ER 500: Each extended release tablet contains Niacin (nicotinic acid) USP 500 mg.
Ridel tablet is a preparation of Niacin. It is proven effective at lowering VLDL, LDL, total cholesterol and triglyceride levels while raising HDL levels. So Niacin has been prescriped for the treatment of cardiovascular disease particularly the hyperlipidemias. Niacin is indicated as an adjunct to diet for reduction of elevated TC, LDL-C, Apo B and TG level and to increase HDL-C in patients with primary hypercholesterolemia (heterozygous familial and nonfamilial) and mixed dyslipidemia. when the response to an appropriate diet has been inadequate. In patients with a history of myocardial infarction and hypercholesterolemia, Niacin is indicated to reduce the risk of recurrent nonfatal myocardial infarction. Niacin is also indicated as adjunctive therapy for treatment of adult patients with very high serum triglyceride levels (Type IV and V hyperlipidemia) who present a risk of pancreatitis and who do not respond adequately to a determined dietary effort to control them. Prior to initiating therapy with Niacin, secondary causes for hypercholesterolemia (e.g poorly controlled diabetes mellitus, hypothyroidism, nephrotic syndrome, dysproteinemias, obstructive liver disease, other drug therapy, alcoholism) should be excluded and a lipid profile obtained to measure TC, HDL-C and TG. Niacin can be administered as a single dose at bedtime, after a snack or meal and doses should be individualized according to patient response. Therapy with Niacin must be initiated at 500mg in order to reduce the incidence and severity of side effects which may occur during early therapy. Niacin is generally well tolerated; adverse reactions have been mild and transient.The most frequent advers effects were flushing, itching, pruritis, nausea and GI upset, jaundice ,hypotension, tachycardia, increased serum blood glucose and uric acid levels, myalgia. Before instituting therapy with Niacin, an attempt should be made to control hyperlipidemia with appropriate diet, exercise, and weight reduction in obese patients and to treat other underlying medical problems. Patients with a past history of jaundice, hepatobiliary disease, or peptic ulcer should be observed closely during Niacin therapy. Frequent monitoring of liver function tests and blood glucose should be performed to ascertain that the drug is producing no adverse effects on these organ systems. Diabetic patients may experience a dose-related rise in glucose intolerance, the clinical significance of which is unclear. Diabetic or potentially diabetic patients should be observed closely. Adjustment of diet and/or hypoglycemic therapy may be necessary. Caution should also be used when Niacin is used in patients with unstable angina or in the acute phase of MI, particularly when such patients are also receiving vasoactive drugs such as nitrates, calcium channel blockers or adrenergic blocking agents. Elevated uric acid levels have occurred with Niacin therapy, therefore use with caution in patients predisposed to gout. Niacin has been associated with small but statistically significant dose-related reductions in platelet count and increases in prothrombin time. Caution should be observed when Niacin is administered concomitantly with anticoagulants; prothrombin time and platelet counts should be monitored closely in such patients. Niacin has been associated with small but statistically significant, dose-related reductions in phosphorus levels (mean of -13% with 2000 mg). So phosphorus levels should be monitored periodically in patients at risk. Niacin cannot be used in pregnancy and lactation because of a lack of information.